First difficult issue of Nanjing explains that pulse cunkou shows and controls 50 yin-yang exchanges during the day. It is very important reading in acupuncture pulse diagnosis which is not used in traditional Herbal pulse diagnosis as herbal treatment doesn't require knowledge of these 50 periods. Classical acupuncture treatment uses this rule as one of basic principles as during yin period qi flows only through yin meridians and during yang period of the day qi flows through the yang meridians. It means that acupuncture treatment is really successful on yang meridians only during its yang period and on yin meridian only during its yin period. 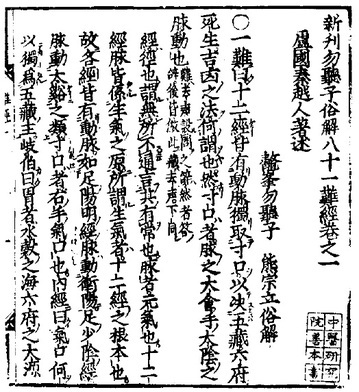 Same difficult issue states that day is divided on 100 ke periods, when 1 ke is half of each of 50 yin or yang periods or 14,4 minutes. It is the second basic rule of classical acupuncture, as yin and yang during each period are increasing and decreasing constantly. When yin is increasing, yang decreases and vice versa. Puncture of yang or yin meridian during yang or yin increase helps stimulate or disperse such meridian according to natural qi flow. It indicates that needle has effect for increasing or decreasing yin or yang only for 14,4 minutes, maximum time of needle retention. Acupuncture wuxing pulse diagnosis shows exact yin or yang period of the day to use yin or yang meridian, this diagnosis indicates also if it is yin or yang increasing or decreasing period to provide stimulation or dispersion for meridian with puncture. Same difficulty mentions that during the day and night each person makes 13500 breaths, it means that each minute person does 9 breaths, half of what normal human does. Acupuncture pulse diagnosis identify 3 changes happening during one minute in three pulse positions 3x3=9. It means that originally breath in Chinese historical texts was cyclical pulse change in cun, guan and chi position. 息 數 不 應 脈 數 Number of breaths doesn't promise number of pulsations.